My neighbor Emily is finally settling into her new house and new role as mother of two very young children. She and her friends are in that stage of life where rushed meals between bottles, naps, and toddler wrangling translate to lukewarm stewed green beans and something resembling chicken. She wants to throw a Thanksgiving dinner for friends that is more "grown up" this year and sought my help. I understand exactly what she means and knew just what to do. Emily invited me over for a little tea and sympathy so we could chart out how to put this gathering together. Since she is short on time and brain space, I knew we had to approach it in manageable chunks. One overly long to-do list can exhaust and overwhelm. First chunk, start with the fun stuff... dressing the table. Just as a bride often selects her dress first, it allows all of the other decisions to fall into place. Color palette, mood, theme, etc… Consider the china, silverware and serving pieces you want to use. For practical reasons, Emily needed to use her everyday china. (She is still collecting place settings in the fancy stuff!) She also had a great collection of creamware serving platters and trays. So, with simple white tableware, we could give the linens some flair. Emily was drawn to our pattern Garden Gate Ochre. We paired it with a solid napkin in the same color and the ruffled edge nicely set off the shape of her plates. Next, find that inspiration piece that will add a personal touch to the table. Your grandmother’s kitsch-y turkey shaped gravy boat, a beautiful basket bought on your honeymoon, acorns and pine cones the kids’ collected on a recent hike. 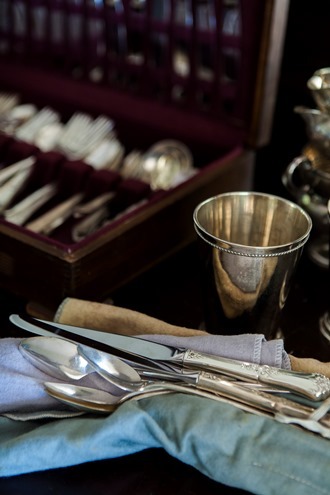 Emily and I quickly honed in on an assortment of antique silver-plated spoons she recently acquired. Click here to see what we ended up doing with them. She also had a set of heirloom silver candle sticks. It was all coming together. A little rustic, a little contemporary. All Emily.